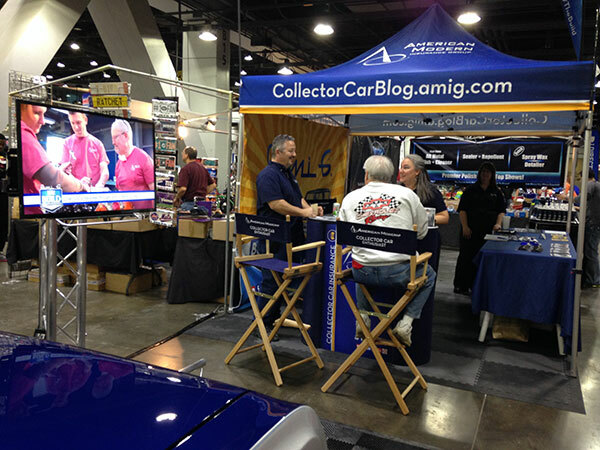 The inaugural collector car show for Ami G. went off without a hitch this past weekend. 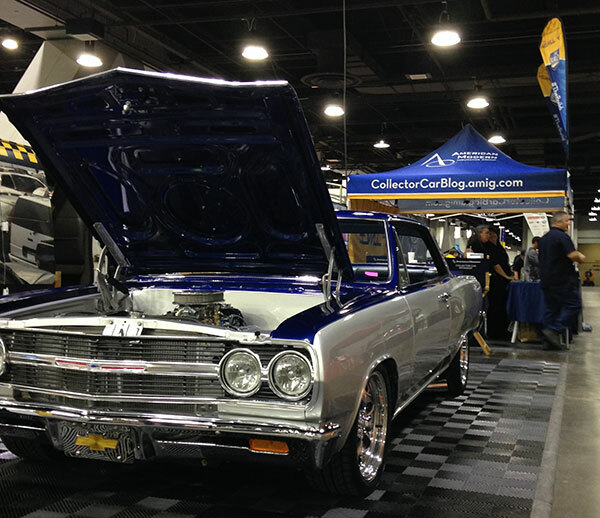 The classic car show – Cavalcade of Customs, downtown Cincinnati – provided a great avenue for the 1965 Chevy Malibu to jump start her touring career. With countless hot rods, muscle cars and customs, Ami G. felt right at home. Of course, the people are what make these events so special. We met a lot of new faces as well as some familiar ones at our American Modern booth. Most people could not believe it was the same classic car. They were impressed that 100% of the repairs and restoration were done by American Modern employees, with the exception of the machine work on the engine. Multiple times, visitors to the booth asked if American Modern specializes in the business of restoring cars as well as selling insurance. I will take that as a compliment! One attendee, while looking over Ami G, said: “American Modern obviously knows what they are doing and truly cares about these old, classic cars and the hobby”. Ami G. attracted a large assortment of new collector car enthusiasts and admirers at the Cavalcade of Customs, especially after hearing her story and seeing what she looked like 2 years ago. The associates at American Modern Insurance Group provided her with this new-found life. Everyone that had a hand in bringing her back should be very proud of themselves for restoring her into a beautiful restomod classic car. Ami G. is looking forward to her next car show. Stay tuned for more details! Rick Drewry and the American Modern team begin by turning the crankshaft in order to get the engine to Top Dead Center (TDC). Initially, the block will be set to 10 degrees advanced when they install the distributor. Rick uses the oil prime tool to spin the oil pump shaft and get the oil flowing. The team chose to go with an HEI setup for the distributor, which includes an electronic ignition with a coil pack mounted on the distributor. It is one of the easiest and most popular distributors to use on older GM V8 engines. With the engine set to 10 degrees advanced of Top Dead Center, they line up the rotor button so it is pointing at the #1 cylinder. 1. You can detach the distributor and turn the oil pump shaft a bit until it falls into place and locks in flush with the block. 2. Or, you can rotate the engine until it drops completely into place. With the rotor button in place, the electrode is pointing at the #1 cylinder. Now you can install the distributor cap and align the distributor so the rotor button is touching the #1 cylinder contact on the cap. You need to gap your spark plugs to 40 thousands before you install them into the engine block. Meticulously we continue to restore the 1965 Chevelle Malibu SS classic car on The Build. Be sure to stay up with The Build on our YouTube Channel, to see what else is restored. Also, continue to follow along with the collector vehicle on our Facebook page. Senior Collector Car Claims Specialist of American Modern Insurance Group, and host of The Build, Rick Drewry, will install and seal the intake plugs to prevent leakage. With the gaskets in place, the team will be installing the water pump, oil filter mount and oil filter onto the engine block of the ’65 Chevelle. 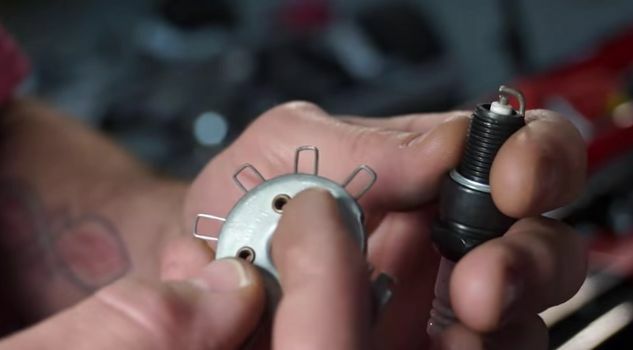 Rick points out that before you are going to put the fuel pump onto the block, you should make sure that the fuel pump push rod is up and out of the way, so you can avoid any problems with installation. Using a low mount alternator bracket, the alternator is mounted on the left hand side of the engine block. Once your street avenger carburetor is placed, you can begin to line up your fuel lines. 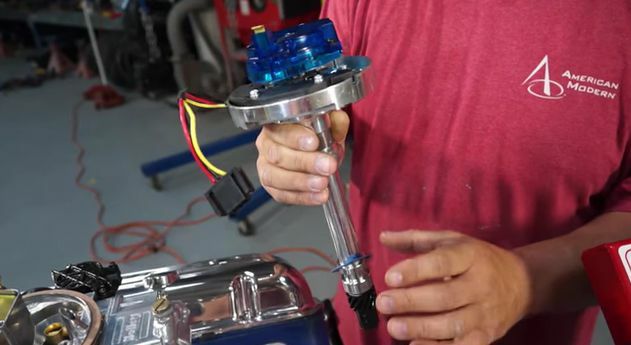 The high-torque mini starter is bolted up and ready to crank over the newly crafted, freshly restored Chevy big block engine. If you’ve been staying up to date with The Build, you probably know, the 1965 Chevy Malibu SS, named Ami G., has made huge strides to become the restomod she is today. Join our mailing list so you can stay current with all of her updates. Also, be sure to subscribe to our YouTube Channel and Like us on Facebook to get the complete list of episodes of The Build.